B'Tselem video shows a Yitzhar resident firing at an Arab, fails to mention that Arabs had tried to set fire to the community. The extreme leftist group B'Tselem disseminated a video on Sunday which depicts clashes between residents of the Shomron community of Yitzhar and Palestinian Authority Arabs. The video shows Arabs throwing rocks at IDF forces and at residents of Yitzhar. The Israeli soldiers are shown trying to prevent more serious clashes by firing tear gas at the Arab rioters. In addition, one of the residents of Yitzhar is depicted pulling out his gun and firing at the Arabs. 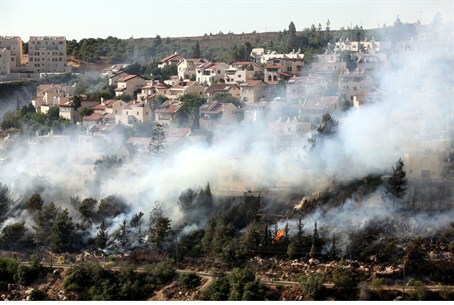 However, B’Tselem, which aims its reports only at Israel and is notorious for publishing one-sided reports aimed at damaging the IDF's and Israel's standing, failed to mention that the residents of Yitzhar were targeted by Arab arsonists and had been on the scene in an attempt to put a fire that had threatened their homes. The incident began on Saturday afternoon at approximately 5:00 p.m. local time, when PA Arabs started a fire in several locations west of the community. As the fires continued raging, residents of Yitzhar streamed to the site to assist the fire crews. Some of them responded by throwing rocks back at the Arab rioters. Only about an hour after the incident started, did the soldiers respond to the riot and dispersed the Arabs, who went back to their village.